There must have been something that led the British to undertake an arduous journey from Kolkata to Shimla every summer. The moment the train chugged into Kalka Railway Station, the faces of all the passengers started beaming with happiness. The train, which was running from Howrah, was four hours late. But the consolation for the tired passengers was that they had a beautiful destination to reach — Shimla, one of the most popular and picturesque hill stations of North India. Located 90 kms away, the next stage of the journey was not by bus or car but in a “toy train”. Also known as narrow gauge train, the service was started by the British in 1898 to connect Shimla with the rest of India. The train passes through forests, mountain terrains, villages, tunnels and bridges, offering spectacular views. The best part is that the train hasn’t changed a bit from the outside or inside from the British days. Perhaps, this was the reason why Unesco added the Kalka-Shimla Railway to the World Heritage Site of Mountain Railways in 2008. As passengers started boarding the toy train, everyone took out their cameras. Inside, the seating arrangement was just as it was during the British era. After many twist and turns, overlooking beautiful landscapes of mountains and forests, one reached the small station of Shimla. Shimla, now the capital of Himachal Pradesh, was once the summer capital of British India and has a very fascinating history. The small hill station attracted British rulers in 1815 when Gurkhas attacked it. In a bid to counter the attack, when British came to Shimla, they were awe-struck by its natural beauty and cold weather. Its picturesque mountains impressed them so much that it became their second home. And in 1864, they declared it Colonial India’s official summer capital. Soon the city was fully developed by the British rulers and their imprints can be found everywhere even today, be it in the famous Mall Road, Viceroy Lodge, churches, post offices, hotels or homes. Sadly, Shimla has not remained the same since the British left. Now the main city has been totally commercialised. It is fully modernised, roads are full of traffic and the green mountains have turned into a concrete jungle. The spectacular view, which Shimla is known for, is nowhere to be seen and in its place are big hotels, shops and restaurants. I stayed at Mashobra, a few kms away from Shimla. After driving for 40 minutes from the main town, one reached the beautiful Marigold Sarovar Portico. Far from the hustle and bustle of the city, it is located in the peaceful and calm hills of Mashobra. Mighty mountains and vast expanse of greens surround the hotel and offer breathtaking views. One can spend hours just appreciating its surroundings. There is no honking of cars, the roads are empty and there is a small jungle ~ what more does one need? In terms of amenities, it has 41 classy and contemporary swiss cottages, studio apartments and modern rooms. Their cottages are a great example of old world charm built in Shimla’s typical architecture style. By the time, I reached the hotel and was done with lunch, it was turning dark. The hotel manager, Manoj Dev, strictly advised me to not go far as the temperature dips very fast in the evening. However, he suggested a visit to Naldehra Golf Club, located near the hotel. Built in 1903 by Lord Curzon, the golf course is one of the highest in Asia. They say Lord Curzon liked the place so much that he named it after his daughter! It is a perfect spot for picnic, trekking and horse riding. Entry to the golf course is limited to members only. After my exhausting travel and trekking, I just wanted some good food. Craignano, the all-dining restaurant of Sarovar Portico, came to my rescue. The chef prepared some local mouthwatering dishes, which ended my day on a good note. When in Shimla, one can’t ignore apples. Sadly it was not apple season but a visit to an apple orchard was mandatory. My craving for apples landed me at the Regional Horticulture Research Station, which is just a ten minute drive from the hotel. It is an institution, where research on apple trees and other plants are carried out. Interestingly, the apple garden also has a British connection — it was created by Alexander Coutts, a tailor to the then Viceroy of India, Lord Dufferin, in 1887. The orchard houses almost every variety of apples that grows in India, including some of the English ones such as Yellow Newton, King of Pippin and Granny Smith. My next destination was Shimla proper. 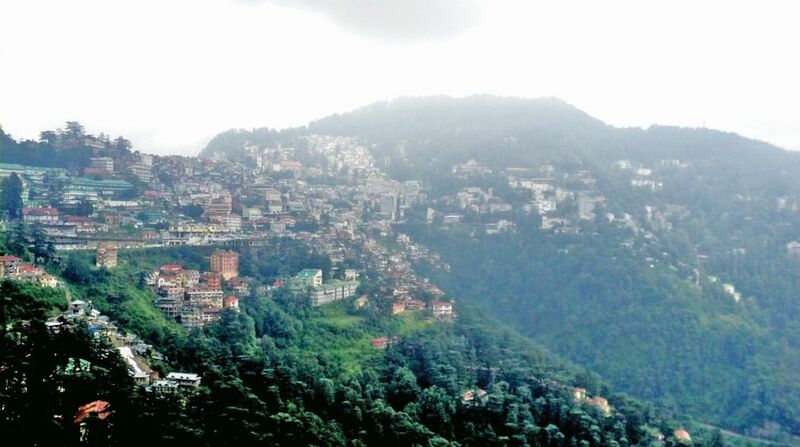 The main motive to visit the city was to find out the reason that led the British government, their families, servants and merchants to make an arduous journey of 2,000 km (from Kolkata) to this small hill station every year. The Viceregal Lodge, or Indian Institute of Advanced Study, was my first stop. Built in 1888, it is a perfect example of British architecture. During the British Raj, the place was the abode of the Viceroy and was later turned into Rashtrapati Niwas after Independence. It was there in 1947 that the decision was made to partition India and, subsequently, the two countries of Pakistani and Bangladesh. Mall Road, another major tourist attraction, was also built by the British and now appears as a small English town. It is full of little shops and larger buildings in the Tudor, Victorian and Edwardian styles, fast-food restaurants, coffee shops and boutiques, where one could spend hours on end.